Your iPhone X/8/7/6/5 may freeze for several different reasons, but there are often some common ones you can check. By knowing these reasons clearly, you will be able to deal with how to unfreeze iPhone smoothly with proper methods. If you desire to find suitable solutions to unfreeze your iPhone, this guidance will be quite suitable for you to read. This tutorial will list some reasons and methods for this issue. You also have the chance to learn how to back up iPhone before unfreezing your iDevice. Although the reasons that can cause your iPhone to freeze are diverse, I would like to highlight some common ones here for your reference. 1. If you overwork your iPhone, the device may get hot, which may lead to the freezing of your iPhone. You’d better control the time you use your iPhone. 2. If you run many apps on your iPhone, it will be easy for your device to freeze. Therefore, you’d better close the app when you are not using it. Thus, it can reduce the iPhone memory load to some degree. 3. One most common reason for your iPhone to freeze is the unresponsive apps on your device. The apps you have installed on your iPhone may be not stable due to their own codes, which can cause your device to get frozen when the app is unresponsive. 4. If there is a glitch or a crash in the software of your iPhone, your device may also end up in freezing. 5. When the storage space on your iPhone is insufficient, your device is likely to get frozen since it can not work normally without storing temporary files in space on iPhone. It is sensible for you to pay attention to your iPhone storage space regularly to avoid the occurrence of this issue. 6. If your iPhone system is old, the system or firmware glitches may cause iPhone to freeze. You are recommended to update your iPhone system version to fix this issue. When your iPhone gets frozen, you can refer to the common reasons listed above to check your iPhone device and find proper ways to fix how to unfreeze an iPhone. When your iPhone does not respond at all after you try to touch or tap on the device screen, it means your iPhone gets frozen. In that case, you may feel confused on how to unfreeze your iPhone. Luckily, there are a lot of methods that can assist you to fix this error. Here I would like to share some of them for you to make it. When your iPhone gets frozen due to unresponsive apps, you can close them to deal with how to unfreeze iPhone. 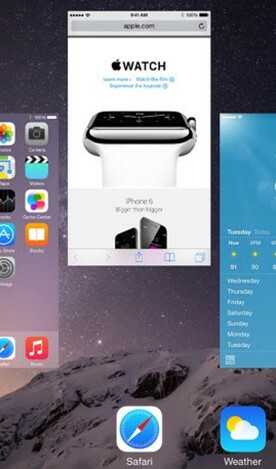 You can do that by pressing the home button twice and then swipe up the unresponsive apps. You’d better uninstall the unresponsive apps after you close them to avoid iPhone freezing in the near future. If you are wondering “how can I unfreeze my iPhone”, you can try to reboot it to get rid of this issue. 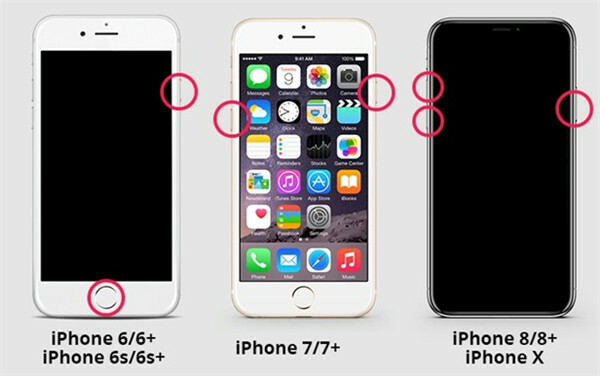 For iPhone 6 or below series, you need to hold down the home and power buttons together for a while until the Apple logo shows up on the screen. Thus, you can release the buttons to allow your iPhone to restart. For iPhone 7 series, you need to hold the ‘Sleep/Wake’ and ‘Volume’ button until you see the Apple logo on the screen. For iPhone 8/8 Plus and X models, you need to hold and release down the ‘Volume up’ button. Afterwards, you need to hold the power button until the Apple logo appears. You can also try to use Settings app to fix how to unfreeze iPhone properly. The steps are shown below for you to check out. 1) You need to run Settings app from the springboard and then click on “General” tab. After that, you need to drag down the screen to find the option of “Reset” to tap on. 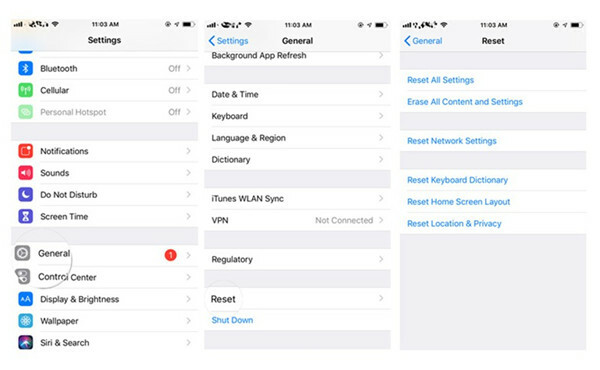 In the next screen, navigate to the “Reset All Settings” option to begin to reset your iPhone device. 2) Follow the on-screen instructions to reset settings on your device to solve “how do you unfreeze an iPhone”. If you are worried about “how do I unfreeze my iPhone”, you can free up some space on your iPhone to fix this issue that caused by insufficient storage. You can remove some apps, images, videos, songs or other contents that occupy your memory space from your iPhone. After that, you can restart your iPhone to try whether this issue has disappeared. Before you delete your iPhone data, you can use iTunes, iCloud or a third-party program to back up the iPhone contents to computer for later use. As for the problem of “how to unfreeze my iPhone 6 plus”, you can make use of iTunes on computer to restore a backup to get rid of this trouble. You can refer to the detailed steps in the following to have a try. 1) Run iTunes on computer and then use one USB cable to connect iPhone with computer. You need to make sure the iTunes version is the latest one on your computer. 2) When iTunes has detected your iPhone device, you can click on “Preferences > Devices” to ensure “Prevent iPods, iPhones, and iPads from syncing automatically” is checked. 3) After that, you need to hit on the icon of your device and then navigate to the tab of “Settings > Summary” to find the function area of “Backups”. 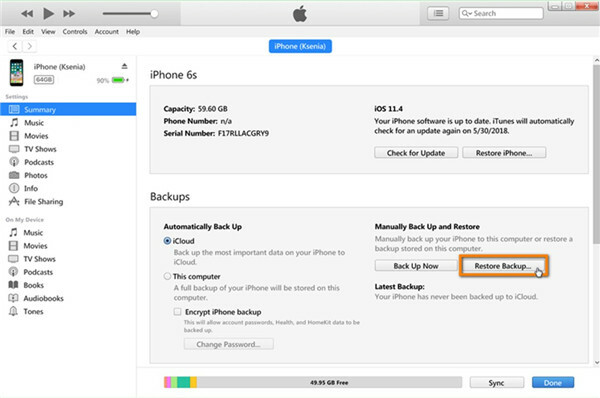 Thus, you can click on the option of “Restore Backup” to choose the backup info you want to restore to iPhone. In the end, you need to click on the “Restore” button on the pop-up panel to start restoring the iPhone data. The solutions shown above are quite useful to unfreeze your iPhone device. When you encounter the same issue, you can try them one by one until the problem is coped with perfectly. Before you fix unfreezing iPhone X/8/7/6/5, you’d better back up your device to avoid data loss. When it comes to backing up files on iOS devices, I strongly recommend you take advantage of Leawo iTransfer to help you. 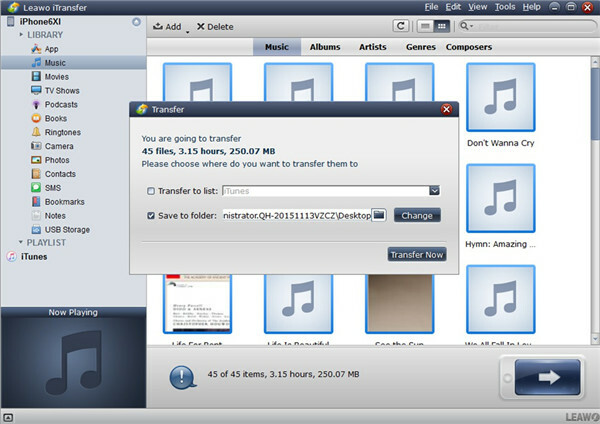 This program is quite powerful, which can transfer files among iDevices, iTunes and computers without the sync of iTunes. This tool can do you much help to transfer apps, songs, videos, ringtones, pictures and other types of files with no efforts. Now you can have a look at the contents shown below to get this work done excellently. Music will be taken for instance in this part. Use a matched USB cord to insert iPhone into your computer and then launch the program on computer. 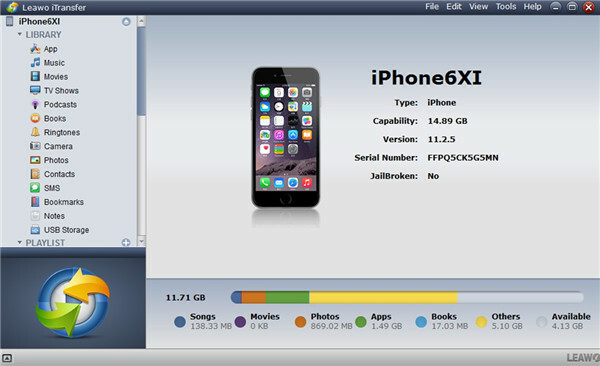 The software will detect your iPhone device automatically and display iPhone info in the right part of the window. Click on the iPhone icon and then choose the “Music” option under the menu of “LIBRARY” to hit on to check all iPhone songs in the right part of the software screen. You can select the music you desire to back up to computer and then tap on the transfer button at the bottom right corner of the interface. In the pane that shows up, you need to click on “Transfer to > My Computer”. 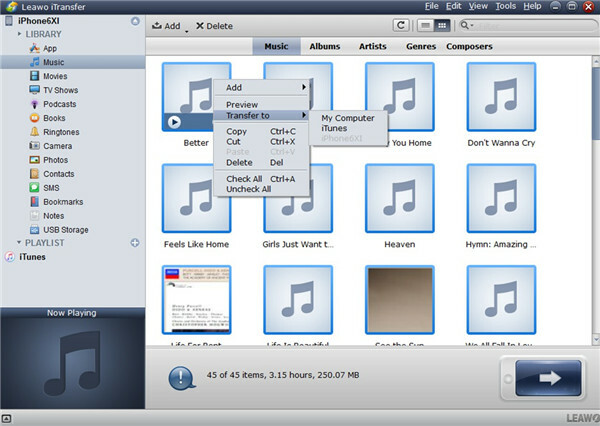 Afterwards, you need to tick the option of “Save to Folder” and then click on the folder icon to select one place on your computer to save the exported music from iPhone. Finally, you can click on the button of “Transfer Now” to wait until this process comes to an end. It will only cost you a few seconds. As you can see, Leawo iTransfer is fairly simple to handle the transfer tasks. If you want to back up other kinds of files from iPhone to computer, you just need to choose the corresponding category from the left sidebar to click on and then select the detailed files you desire to transfer to computer for backup. When your iPhone gets frozen, this tutorial may direct you to address this issue with various methods. I hope it can help you get rid of this problem quickly. If you are really fond of this guidance, you can recommend it to your friends to check out as well. They will surely appreciate your recommendation when they encounter the same issue and are eager to find a method to unfreeze iPhone.